Saturdays | November 3, 10, & 17 at 7:30 p.m.
Sundays | November 4, 11 & 18 at 2:00 p.m.
Thursdays | November 8 & 15 at 7:30 p.m. Borrowing from the Arthurian legends, Lerner and Loewe’s Camelot is the duo’s fantastical masterpiece which triumphed on Broadway in a legendary original production that lead to a film version, and numerous revivals in New York, London and across the globe. Its Original Broadway Cast Album topped the charts for 60 weeks, with a rich score boasting such gems as "If Ever I Would Leave You," “I Loved You Once in Silence,” "The Lusty Month of May," and of course, "Camelot." An idealistic young King Arthur hopes to create a kingdom built on honor and dignity, embodied by his Knights of The Round Table. His Ideals, however are tested when his lovely queen, Guinevere, falls in love with the young Knight, Lancelot and the fate of the kingdom hangs in the balance. Assisted Listening devices will be available for all performances. 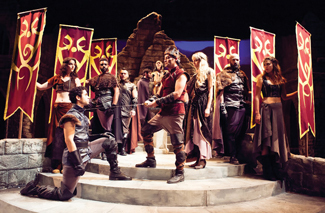 Open Captioning will be available at the Nov. 10th & 11th performances of Lerner + Loewe's Camelot.